Sekonic RT-32CTL Radio Transmitter Module provides compatibility with the PocketWizard ControlTL channels in addition to the original Standard triggering channels.Compatible with both FCC (USA) and CE (Europe) frequencies, the RT-32CTL Radio Transmitter module can be used in Sekonic wireless-ready meters and supports all ControlTL channels available for either market system as well as ControlTL Zones (A, B, C). Both ControlTL and Standard signals are broadcast with each trigger so ControlTL and Standard radios can be used together. This enables photographers to precisely set up dimensional lighting scenarios quickly and easily in the Studio or on location.The RT-32CTL transmitter module is universal and can be used with either USA/North America market products or European products. 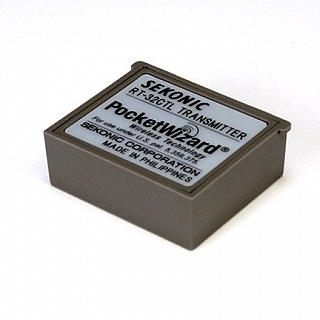 Compatible with ControlTL products as well as Standard channel products of PocketWizard. Use for triggering PocketWizard ControlTL Products such as MiniTT1, FlexTT5, ST4, MC2. Also triggers Standard PocketWizard products such as PLUS series and MultiMAX.